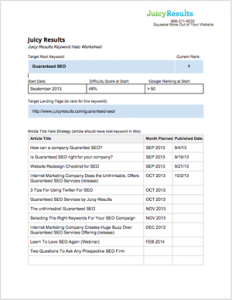 How does Juicy Results guarantee its SEO service to clients? The answer is process. By first studying Google’s intended user experience, we have been able to develop our completely white-hat framework to build search engine traffic for just about any type of business. And now, we are publishing our internal operations manual for you to use for your company. The Bootstrapper’s Guide to SEO shares our core philosophy of why Google ranks the pages it does, and shows how you can systematically take advantage of this understanding to build a far-reaching, customer-generating search engine presence. The Bootstrapper’s Guide to SEO is more than just a book, though. We have designed a complete kit to launch your SEO initiatives and have even included the actual tools and worksheets we use within our firm today. As you have probably discovered, there is no shortage of information about SEO available on the web. However, you’re likely frustrated by how much of this information is theory, abstract, highly technical and even conflicting. At Juicy Results, we value clarity and principle-based learning, so you will find this guide a pragmatic and clear read. The process and habits outlined in this book will get you Page One rankings in Google—if implemented. Our goal is to make you as effective as possible, with as little work as necessary. No waste, just productive effort. We’ve outlined the process so that you can standardize these processes and ideas within your organization—even if your entire organization is just you. What’s In The Bootstrapper’s Guide To SEO? The guide is broken down into five core sections. We first explain the core concepts of how Google works and the claims they have made about their vision for their search product. Understanding these underlying principles will guide your decision-making when completing the SEO exercises. From there, the Guide dispenses practical, step-by-step processes for building your Page One rankings. 1. How SEO Works: A high level overview so that you can make better decisions. 2. A Strategic Approach to SEO: Selecting keywords with the sweet spot qualities—those that will actually bring you new customers AND those that you are able to rank for. 3. Web Presence, Not Website: Ensuring your website has the tools needed to rank. 4. Executing SEO: How to rank and how to institute the right habits within your organization to automatically grow your search traffic forever. 5. Measuring Your Progress: How to know what is working, what needs some more attention, and how well you are doing. There are also four bonus appendixes along with several checklists and worksheets. This book is for the entrepreneur, executive or marketer who values clarity and effectiveness. We put this book together to share a practical system that was designed, and proven through our agency (Juicy Results), to reliably expand a company’s online visibility. It doesn’t matter what type of business you run, what your role is or how long you have been online. You need to have a real, differentiated business that adds value to your customers lives. If you are unsure whether you fit this criteria, see this article. You need to be willing to follow the plan and spend the time and creative effort to implement these habits in your company. Take a look at some of the tools we have included to execute your SEO initiatives. These will get you started right away and prevent you from stalling out. Generate a list of keywords for your website that will bring you valuable traffic. 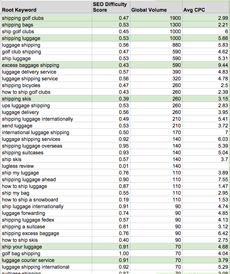 Build a list of keyword targets and prioritize them by traffic, competitiveness and current rank. Design a content plan to attack each target keyword you wish to rank for. Organize your website in an optimized format and map target keywords to individual pages most likely to rank for each. Identify, prioritize and systematically neutralize the link advantage competitors have over you. 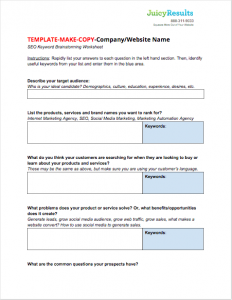 After reading the guide, you will understand why this is important and how to use the worksheet to leapfrog your competitors in search results. Download the free chapter today in the right hand sidebar or take the plunge and start bootstrapping your SEO today! 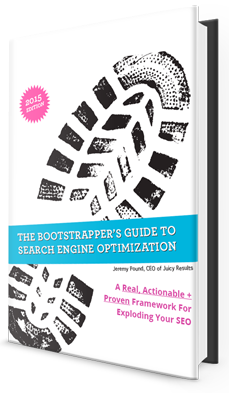 The Bootstrapper’s Guide to SEO is a complete ebook (186 pages, 36,000+ words) accompanied by the actual worksheets and planning tools we use for our clients at Juicy Results and how-to videos. Read our chapter on Keyword Halos to get a feel for what is in the guide before purchasing it. This guide is going to help you crack the SEO code for your business. An executive summary on how Google decides which pages to rank based on the company’s core values and vision for the future. A winning SEO strategy for any company because your approach will be based on where you realistically are today. Use the same tools we use to gain SEO rankings quickly. Understand if your current website setup is holding you back and how you can make small adjustments to get big returns. Learn the underlying philosophy of why these tools work so that you can make your SEO process even better. Watch us walk you through the software and worksheets with screen sharing videos. Real life examples and case studies used throughout to illustrate how the tools and tactics work. Webmaster Tools: Identify any problems Google is having crawling your website. Webmaster Tools: Identify any manual penalties or errors that Google has associated with your website. Webmaster Tools: Ensure that Google is seeing your website the way you intend it to be crawled. Webmaster Tools: Discover what search queries are leading users to your website. SEMrush: Assessing what a website currently ranks for and tracking that over time.